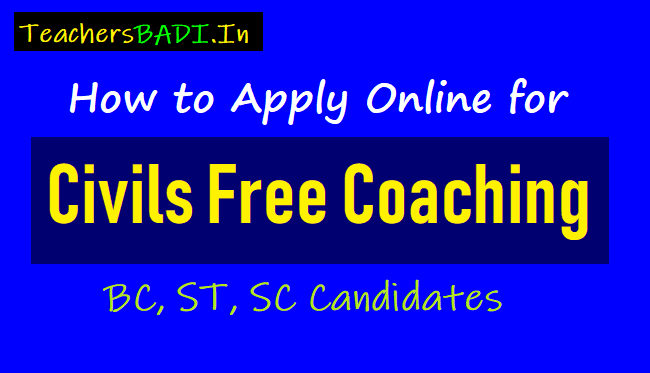 Free Coaching to Civil Services 2018:..
Civils free coaching to ST, SC, BC Students: Government of Andhra Pradesh, Backward Classes Welfare Department, Tribal Welfare Department, Dr. Y.S.R. AP Study Circle and Government of Telangana State, BC Welfare Department would issue Common Notifications in every year for free Coaching to UPSC Civil Services Prelims (Civils free coaching to ST, SC, BC Students). These departments would invite the online applications from the eligible and interested candidates belonging to Backward Classes (BC), Scheduled Castes (SC) and Scheduled Tribes (ST) for attending Common Screening Test for free coaching for Civil Services Examination. Candidates are selected in a Screening Test based on the rank obtained. In their notifications, eligibility criteria for Admission, Important dates, Preference for giving options, Allotment of Seats, Selection procedure and Guidelines have been provided by the departments. These departments have launched new web portals for receiving online applications from the aspirants of both states. NOTE: Data on this page must match the information as it is written in your Certificates . Select your district where you are native of from dropdown menu. Click on apply Online, then online application form will be opened. A. Caste: Please select the social status that is your community from the given drop down menu. B. Is Physically Handicapped: Please select whether Physically Handicapped or not from Yes or No radio buttons. C. Proof of Disability: Please upload your Scanned Copy of Physically Handicapped with size less than 200KB from your computer. Native Of the Candidate: Please select Mandal/Municipality GP/Village/Ward ; GP/Village/Ward and please enter the GP/Village/Ward if not listed above (If Not in the List). Please upload your following scanned certificates with size less than 200KB. Community and Caste Certificate (issued by Tahasildar). Latest Income Certificate (issued by Tahasildar). Please check and declaration radio button. The declaration is "I swear that the facts mentioned above are true and correct. If any information is later found to be incorrect, wrong or misleading, I shall abide by any penal action by the Management." Please Enter the Code Shown in the Image on the application screen.